Hi, it’s Miranda from Inspinration. I am still pinching myself to see if I am not dreaming that I am a KCW contributor. KCW is such a wonderful initiative, I really feel that it gives many people that extra burst of energy to either start or actually finish a project. The last two KCW I actively sewed along (before that I just saw the name pop up on blogs wondering what those three letters stood for, but admiring the results). During those last two active KCW’s I have read and seen how everybody is motivated to go the extra mile in that period, I am honored that I get the possibility to contribute to this motivation. The goal of this post is showing that clothes can be animal inspired without featuring any animal graphics. To reach this goal I took four animals from the ocean and show you what kind of fabric and which type of patterns have similar characteristics as those chosen animals. I hope that this post convinces you that this seasons KCW theme is that fun and versatile, that you simply have to sew along. The first animal I picked is this beautiful fish, a crown tail betta. Looking at the picture I immediately thought of a red party dress. I searched for a picture of child’s clothes that really gives the same vibe as the picture of the fish. I think this girl in her red dress matched the fish very well. The first similarity is obviously in color. Furthermore, the structure of the skirt resembles the structure of the fish tail. The tight bodice made from a slightly shiny fabric increases the likeness even further. Lastly, did you also notice the hairpiece looks like a little fin? For the next part I would like to show you what types of fabrics I would choose if I wanted to make clothes inspired by this fish and what type of pattern I would use. I think the fish looks very fancy and I would therefore use fancy fabrics like silk, satteen taffeta and organza. I picked the reddish versions of these fabrics due to this particular fishes color, but these fabrics exist in many different color schemes. Tropical fish come in almost any imaginable color and color combinations. Sewing with these types of fabric can be a challenge, luckily there are tutorials out there on the web to help you on your way, like this one. When you see this fish dancing trough the water you can easily imagine your own girl twirling with joy. 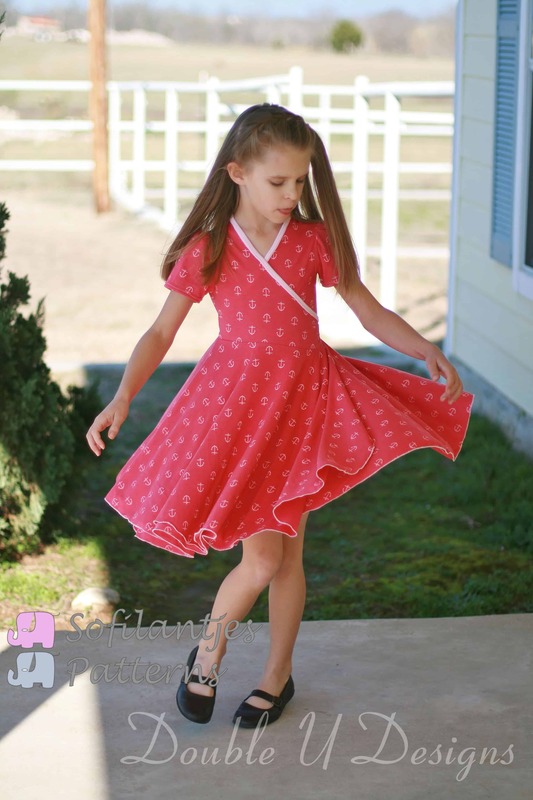 That is why I picked three flowy, twirly dresses as pattern inspiration. The fish in the picture is actually a fighting fish as I learned from clicking on the actual picture, so my inspiration could have taken a whole different turn as well, I would love to hear where this picture would have taken you. For the second animal I picked a shark. I paired this magnificent animal with a picture of a boy in a tight fitted sharp-looking suit with a white shirt. The blue/grey color of the suit resembles the back of the shark and the white shirt the space around the mouth and belly, I love this sharp color contrast. On the picture the mouth of the shark is almost closed, but with just a bit of extra imagination the pink tie of the boy could resemble a shark’s tongue. I feel shark inspired fabrics should be relatively smooth woven fabrics. Fabrics without a fuss, the serious looking type. What comes to mind are plain cotton, denim and chambray. I would stick to the grey/blue spectrum possibly combined with a lighter color. The fabrics should be without a clear print, but they could have a rough look to them, like the skin of a sharp having scars from fights. The second fabric and fourth fabric are an example of such patterns. The possible patterns I picked are cloth pieces with sharp lines, tight fit and in a business casual style. These pieces could easily be combined into a nice suit, but also work on their own. Although my pictures all portray boys, this look could also easily work for a girl as well. Girls can be just as coll and tough as boys. The third animal I picked is the sea turtle. These great swimmers are slow on land and are therefore often associated with a relaxed lifestyle. I therefore picked an outfit with a relaxed fit. The turtle can pull back its limps into his shell which inspired me to think about clothes with a hood. My kids love to wear hoods, both in winter and summer, they love the safe and secure feeling of hiding in it. The picture of the turtle shows a combination of patterns. The shield consists of different sized pieces and the shield has a very interesting color pattern. The skin of the turtle shows squared spots of different sizes and turtle also has uni colored skin varying from yellow to white. The paired outfit shows a similar large variation of patterns from squared trousers, uni color pocket to the striped hood lining. The fabrics I picked for the sea turtle are all in the green, yellow, brown spectrum. I chose fabrics with relatively small repeating patterns on them, these type of patterns remind me of the turtles skin and shield pattern. For the type of fabric I would pick a soft type of fabric, fabrics that are nice and comfortable for kids to wear like knit fabrics or linen. Pattern wise I chose clothes that a child will feel very comfortable in. Loose type of clothes or clothes supporting a high collar or hood in which they can hide. Comfort is crucial for turtle inspired clothes. When looking at an octopus the main intriguing thing is the fact that it has eight arms, imagine having multiple arms, you would never have to use pins again. The girl wearing the purple scrap tutu really reminds me of an octupus with his many arms hanging down. The flexibility of the octopuses skin resembles the jersey fabric used for the girls top. The ruffled neckline could be associated with the rougher texture of the skin the octopuses head. I had a mixture of fabric inspiration thinking of an octopus. On one hand I thought of dots, inspired by the suckers on the tentacles. The body of an octopus is soft and some octopuses use tools to protect himself from being eaten by other sea creatures. I therefore associate an octopus with innovativeness. That is why I also associate octopuses with new innovative fashion fabrics like scuba and spacer fabric. Finally I had to add a black fabric due to the octopuses ability to spray ink. Another way to avoid being eaten is a disguise, some octopuses are great in pretending to be something they are not. Pattern wise I thought of patterns that are not what they appear on first sight. The first pattern I chose is a skort, giving your girl twirly action, without showing of her underwear, because it actually is a short. The second is a shirt which combines the nice crispy look of woven cotton with the wearability of knit. The last dress is a tight woven dress without zipper! This provides double fun, you do not have to put in a blind zipper and your kid can dress herself, that is a clear win win situation. I hope you had as much fun looking and reading through my post as I had fun making it. I would love to hear if you would have picked similar fabrics and patterns or if you would have gone a whole different way. Or would you have prefered seeing other ocean animals? I am thinking I should do something shark inspired for my nephew. I like the idea of something like a denim that is a bit distressed to give an interesting texture. I have also been toying with idea of using something like a vinyl or a distressed metallic. I’m not quite sure how I could make that workable though. I struggle with adding interest to little boy clothing without adding appliques or the like. I’m loving the turtle inspiration. So cool with all those textures! How inspiring Miranda!! You defenitely inspired me to make some surfpants for my boys! Miranda, This is so perfect! Love each and every one of these and how they can be very fancy or everyday! Beautiful inspirational post. Thanks Audrey, may be an idea for the next skirt awards, best animal inspired skirt? What a fun post! My son will be very amused to hear that, by modelling a skort intended for a friend’s daughter, he made you think of an octopus!! Thanks for the link. What a fun inspiration post. I really want to start sewing right away! I love all this underwater inspiration! Such a clever way of using the theme! Glad you liked it, I had a lot of fun putting it together!